Since you may be hiring me to enter and clean your home, it would be nice to have a good idea of who I am and where I'm from! My name is Fred Weddington. I've been a Downriver MI resident for nearly 30 years. I currently live in Trenton with my wife (Lisa) and two beautiful daughters (Claire & Paige). I graduated from Grosse Ile High School and progressed to both Wayne County Community College and Ohio-State University. I studied Web Design and Computer Science. 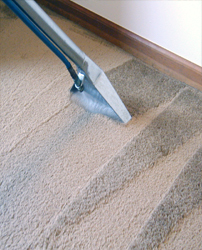 During my search for work just after college, I took a "desperate" job as an apprentice carpet cleaner. To my surpise, I really enjoyed it. I enjoyed it so much that I decided to start Honey-Do Carpet Care.